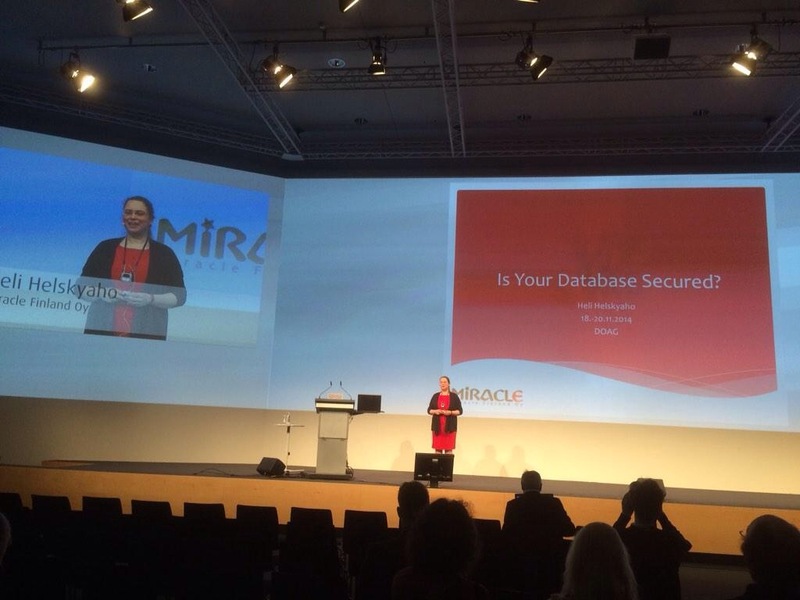 On Nov 18-20 I attended the User Group (DOAG) event in Nuremberg, Germany. The event was amazing. The content was super quality, plenty of people to network with and such a great hospitality from the organizers. On Tuesday I presented with Jeff Smith from Oracle Corp. We were showing how Data Modeler can be used in collaborative work with Subversion and with Microsoft Excel. I think the presentation was very well taken and I always love speaking with Jeff: he is fantastic. And I am glad Maria Colgan found our presentation both informative and funny:) Thank you, Maria, for your great feedback! In the evening we had the speakers’ dinner in a lovely small restaurant. We had a fun and enjoyable evening! On Wednesday I did not have any presentations but I attended the user group presidents’ meeting that DOAG was kind enough to organize. The meeting was excellent and we shared a lot of ideas and concerns. In the evening we had a great conference party with plenty of food, drinks, football and music. And a lot of networking. FUN! The content in the conference was excellent and everything was just perfect but I think the most valuable thing in visiting events is meeting people. I met many of my friends and I made so many new friends it makes me happy. And I must say the Nuremberg airport was a great place to be on Thursday evening to meet the rest of the gang:-) It was so nice to see you all! Thank you DOAG for your support to the Oracle Community! And thank you for inviting me! Here we go. As I have mentioned probably too many times I am writing a book and I love it. People told me that there is a thing called “writer’s block” that will hit you several times during the writing. I was thinking it will never hit me because I love writing so much. Once again I was wrong. It did hit me today. I am working on several chapters (one is still waiting for my finalization for tech editors and four chapters waiting for me to implement the comments from tech editors) and I just jump from one chapter to another and hope that a miracle happens and I write again. But no. Cannot get it going.